Let's bookend this month's blog entries with yet another curious moment in the history of the so-called World's Greatest Comic Magazine, discovered while reading the second Fantastic Four Omnibus volume (and on a side note--having finally finished said tome, I noticed that in one of the text pieces following the classic Lee-Kirby stories, none other than Jon Cooke also made note of Professor X's stand-up performance at the Richards nuptials! Great minds think alike and all that, eh?...). 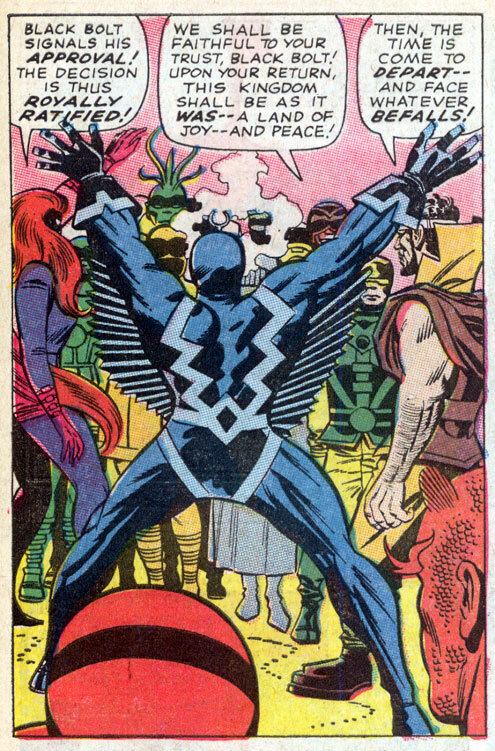 Anyway, the thing I want you to take careful note of in the above panel is the first word balloon and Black Bolt's pose, okay? Let''s see, that stance translates into both approval AND impending disaster? Gee whiz, it probably also means "I have to make a number two", "Where's the TV remote--I've seen this episode of "Three's Company" a hundred times", and "Don't you think it's about time you get a trim, Medusa?". Marcel Marceu had nothing on THIS guy, lemme tell you!! Several months back, over at The Comics Reporter, Tom Spurgeon very cleverly hoodwinked his readers into helping him build up a backlog of questions for his more or less weekly feature, the Five For Friday poll, by calling for--you guessed it--five potential future topics from each of his correspondents, of which I was one. Well, one of my chickens finally came home to roost this past weekend, as Tom used a modified version of one of my suggestions as his latest blanket query, so c'mon--how could I possibly refrain from participating? 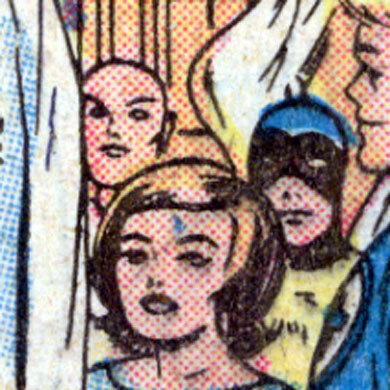 Go take at look at Five For Friday #125 : Cameos, cuz (as I well know), there ain't nothing cooler than real people co-populating panels with fictitious characters!! There it is, surrounding Mark Evanier's biography of Durwood Kirby (gee, who knew Garry Moore had such a pronounced dark side?...) and right above several volumes concerning Barry Bonds setting the all-time home run record, sits three copies of THE NEARLY COMPLETE ESSENTIAL HEMBECK ARCHIVES OMNIBUS! Just like a REAL book! Wow! Big thanks to Bill Roberge--who happens to not only work at that particular New Hampshire branch of Barnes and Noble, but also ordered said books, made the display, AND sent along the pictorial evidence of same! That's cuz Jerry Hillegas owns it! And speaking of bound volumes, James Henry recently commissioned me to compose a quartet of multi-character pieces to specifically accompany his bound volumes of X-MEN and FANTASTIC FOUR comics. So far, he's posted one of the illos over on his Mighty Mighty MOC-BLOG--Official Blog of The Mid-Ohio-Con 2008, which you can see by going here. 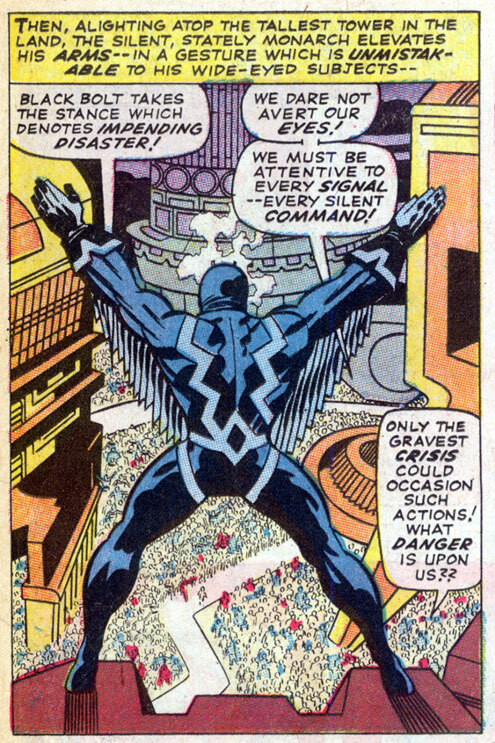 It features baddies and goodies alike, all of whom appeared somewhere within the pages of FF 251 through 275 (including good ol' John Byrne himself, seen here clinging for dear life to a certain silvery surfer). I'll let you know when James eventually posts the other three pieces--meanwhile, there's lots of other nifty stuff to be found on his blog, so take a look! That's it for today folks, but I'll be back soon--promise! Actually, the night before (Tuesday, June 10th), Lynn, grandma, boyfriend Alec, and I went to listen as Julie and ten of her classmates spoke about each of their recent month long internships. The senior class was divided into three equal segments, so that none of the parents had to sit through 33 individual recitals, which made for a shorter evening than I'd originally anticipated (a mere two hours) but ultimately proved mildly disappointing, as listening to the kids varied experiences proved to be quite interesting. Students worked at horse farms, nursing homes, dentist offices--and three girls even spent the time in India, helping to build a library! I felt sorta bad for the guy who had to follow up THAT selfless tale with his story of hopping a train each morning to go sit in an office, brainstorming plans for a website featuring teen generated video material!! Kind of a jarring juxtaposition, y'know? Sorta like Ghandi followed by an MTV video jock. Julie, as you may recall, worked at a museum's planetarium, and wound up speaking next to last for little over ten minutes. When the floor opened for questions, I was very, very tempted to ask my junior space cadet just what the proper pronunciation of "Uranus" was, but I bit my tongue. Probably best for all concerned ..
After returning home for a quick night's sleep, the entire group reassembled early the next morning--with the addition of Lynn's brother, Julie's Uncle Bob--and we headed for the Poughkeepsie Day School on a bright, sunny morning. Shortly after 10 AM, the entire class filed in and took their places. After a few short introductory words by a member of the faculty, each student got their chance to say a few words. That's right--we had 33 valedictory addresses looming before us! Well, 31, as two students chose to forego the opportunity altogether. One other girl elected to play a short classical piece on her violin, another three sang pop songs (Fleetwood Mac's "Landslide", a Lou Reed ditty, and a third tune I was unfamiliar with, each accompanied by a non-graduating guitarist), and one young lady, after the briefest of thanks, announced, "Now, I will dance for you." And she did. Quite nicely, too. Actually, the musical interludes broke up the speechifying rather nicely. Students were asked to keep their remarks within the two to three minute range, but that wasn't always the case. Julie, fourth out of the box, spoke for little over two minutes (Alec, sitting back in the cheap chairs--each family was issued only four prime up front seats--timed her at precisely 2 minutes, 11 seconds), delivering an all-encompassing thank you to friends, family, and faculty, while being one of the few speakers looking ahead to her specific plans for college. Nicely done, kiddo, but y'know, you had enough time--you COULDA plugged my book! A few of the speeches barely lasted a minute--and a few of those were delivered choking back tears, and not always successfully. Several passed the five minute mark (again, thanks Alec), with one young lady spouting a line specific to each and every one of her classmates (luckily, she was, as a matter of course, a fast talker). 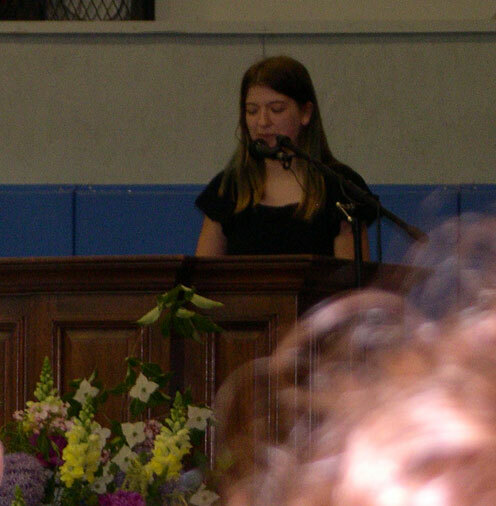 Another girl shared memories with the audience regarding approximately half of the class of 2008, which sort of violated the spirit of the old rule of, "if you don't have gum for everyone...". 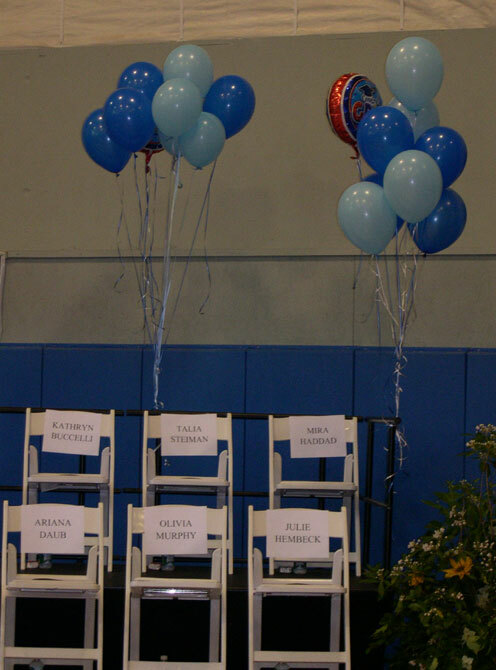 Some of the graduates were amusing, some were whimsical, some were nostalgic. Some had been attending PDS since pre-school, some since the third or fourth grade, and one or two just three years (Julie clocked in at four), but all of them seemed genuinely appreciative of the experience. Out into the hallway we went, heading for the complimentary snacks (mmm--complimentary snacks), with a few stops for photo ops along the way. Here she is, folks, the star of the day! Here's the graduate with her proud mom! 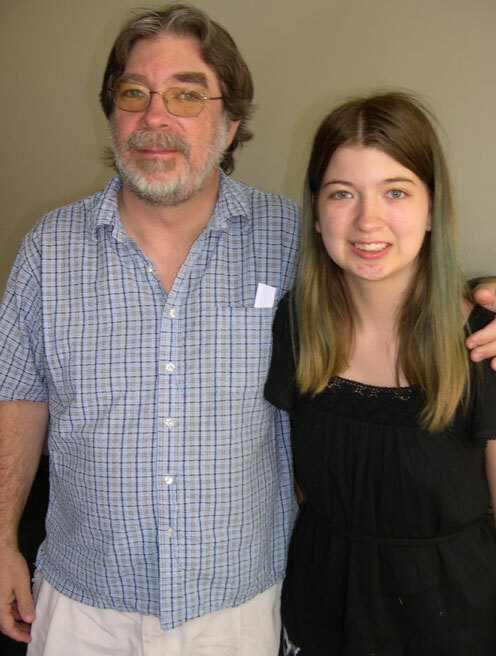 After spending a few more minutes with her friends (and me a few quick minutes with Herb Trimpe, whose wife's daughter was also graduating that day), we left the hallowed halls of PDS, leaving high school behind forever. Well, at least until the next time we go to an Adam Sandler movie, that is! Congrats. Little Hembeck--you done good!! Also, I need to mention the untimely passing of George Carlin. A very funny guy whose material always managed to be sublimely clever AND hilarious simultaneously. I have particularly fond memories of a mostly forgotten sitcom he headlined on Fox several years back. While hardly a comedy classic, it certainly deserved a better fate than expiring after a mere dozen episodes, if only to observe how the program's writers utilized the Carlin persona in the context of an ongoing scenario, all the while surrounded by a handful of recurring supporting characters. He'll be missed. Lastly, what of the recent turbulent turnover at the Mets' helm? A week after the fact, the late-night, west coast dismissal of Willie Randolph still looks extremely tacky, but seeing how the team has responded to new skipper Jerry Manuel in the days since, it more than ever looks like Willie's firing was the right move, just a move made in a VERY ill-considered manner. 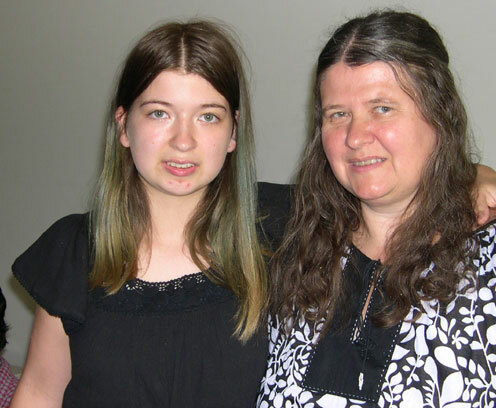 Late Tuesday night, daughter Julie suddenly felt as if the flu was coming down hard on her, but by the next evening, things turned even worse, and we found ourselves in the emergency room of our local hospital. We left the house about 10:30 at night, and given the number of tests--and their inevitable duration--we didn't return home until 5:15 the next morning (thank goodness for those overhead TV sets that help while away the time--I know I'll now never forget the "Odd Couple" episode that had the IRS investigating Felix, then Oscar, that we all watched at 3 in the morning as we waited for test results to come back). The docs thought they'd found an antibiotic to successfully battle Julie's infection--and ultimately they did, but it really didn't kick in properly until Friday night, cuz Thursday evening, despite the medicine, Julie's fever spiked again to near 104, and while we managed to tough it out at home, Lynn made the decision then that she was gonna stay home with Julie on Saturday rather than leave her to her own devices as originally planned. Absolutely the right thing to do--I knew that--but it DID put me in a somewhat precarious position. Y'see, I have an absolutely horrible sense of direction, just horrendous. And it's not so much that I'm one of those stereotypical males who won't stop and ask for directions--it wouldn't do any good even if I did because I've found in the past that whenever any well meaning stranger gave me directions, it plain just doesn't sink in. They may just as well be speaking to me in a foreign lingo. Yup, I'm THAT bad. So, HOW was I ever going to find my way to Saratoga--a three hour trip up north--without Lynn's expert guidance? Well, luckily, I have two good buddies--Rocco Nigro and Roger Green--who live in Albany, an hour south of Saratoga and definitely on my way, who were planning to attend the show, so happily, late Friday evening, we arranged to meet at the Crossgates Mall, right off the NY State Thruway (a destination even I could find on my own, if just barely), with them helping get me safely on up to the con! Thanks guys! At the convention, I had the pleasure of finally meeting Alan David Doane face to face for the first time, after several years of occasionally corresponding via email. A swell fellow in every way, he also covered for my leaving my camera at home and took a bunch of pics. This was especially important to me cuz I found myself situated right across from an actual classic 1966 Batmobile from the Adam West show, with a troupe of "Star Wars" actors off to my right (including a life-sized, radio controlled R2D2). Alan sent me the photos, but as he's posted them all on his own blog (as well as his own pithy comments regarding the event) you can see 'em all simply by going here. Hey, might as well let HIM do the heavy lifting! (And check out both the recent Father's Day gift of a shirt I'm wearing--direct from the local Goodwill (I'm NOT kidding)--and observe the unassailable evidence of a "bald spot" up top my dome whose existence I've been denying for years, despite wife Lynn's protest to the contrary--why is she ALWAYS right?...). Besides chatting with Alan and bantering with table neighbor Matt Smith (who warned me to take another route out of town from the one that brought us in to avoid the masses who were descending on the area to attend a Dave Matthews concert that very evening--again, I'd've been cooked without Roger and Rocco's knowledge of the back ways out of town), I met a couple of very talented gents named Mark Gonyea and Sam Girdich, aka Strongarm Labs. Mark gave me a pair of his story posters (go take a look--they're truly dazzling, and even more so in person), and I picked one of the comics he worked on with writer Girdich, THE TALL AND THE DEAD. VERY nice stuff! If talent means anything, these guys should do just fine--nice to meetcha, fellas! I also met Roger Rautio, Chief Executive Officer of the recently established Comic Book Hall of Fame. It'll be interesting to see where things go with this institution in the months and years ahead, as Roger seems to have a lot of exciting ideas--here's hoping they come to pass! See you again at my induction ceremony, Rog!! Overall, a delightful day, as I got meet a score of other nice folks, AND spend some time with my two long-time buddies. We successfully got out of town before the Matthew-ites could overwhelm the burg, and then, after dropping Roger off at home (to spend a little time giving wife Carol some relief from attending to the many needs of their sweet young daughter Livia), Rocco and I had a nice dinner before I finally headed on home. Here's my short, better-late-than-never, recap of my day at the 2008 MoCCA Art Fest, back on Saturday, June 7th. Lynn, Julie, Alec and I took the train down to NYC, and hopped a cab on over to the show (and, incidentally, as someone who's taken a couple dozen Big Apple cab rides in my time, this was the first time I actually feared for my safety! But we made it to our destination unscathed--AND in (gulp) record time as well!...). Arriving at the show shortly before noon, we took a quick spin around the artist's tables on the first floor, running into my old buddy, Rocco Nigro, and his gal pal, Kara, in the process. Soon after, I checked in with Justin, my MoCCA liaison. 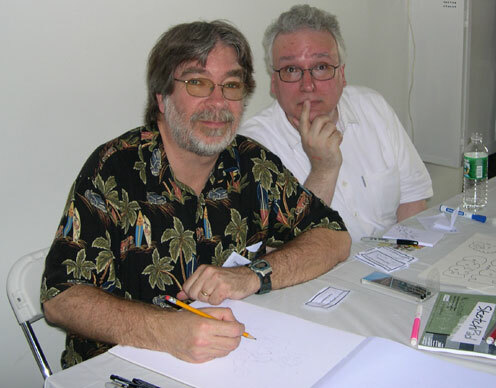 After seeing that I was fed, he set me up with paper, pencils, and pens,and--with the ever delightful Jim Salicrup in the next chair over--I sat down to work. During my tenure of doodling for dollars, quite a few notable folks stopped by to say hello: the talented designer, Alex Jay; Ditko biographer, Blake Bell; Alex Robinson and his lovely missus, who gifted me with a copy of his latest book, TOO COOL TO BE FORGOTTEN (which I still need to read), while I signed his copy of my own new volume (which, um, I may've mentioned here on the site a time or twenty in the past...); the ever mysterious Neilalien; the ever popular Walt Simonson; the ever erudite Danny Fingeroth; my buddy, the talented and unique artist, Travis Louie (go look); the ever friendly Keith Williams, sitting to my right doing MoCCA art himself, chatting with Lynn while I kept a' drawin'; Sean Howe, the (ahem) perceptive fellow who wrote the review of my book for the EW website; the legendary Denis Kitchen; and seemingly emerging from out of the mists of time, looking no different than he did when last I saw him nearly three decades ago (save for having perhaps even longer hair than he did back in the eighties), my very first publisher, Dean Mullaney! Not to mention all the swell fans who stopped by to say hello, natch! It was fun, if a bit tiring (the temperatures in the upper nineties didn't help much). Afterwards, Jim joined us for a very tasty--and comfortably air-conditioned--meal at an Indian restaurant located in the bowery (it should be noted that the Sub-mariner, bearded or not, was nowhere in evidence). After a good dinner--and good conversation--we bid Jim adieu, took a much less fear fraught cab ride back to Grand Central Station, and went home. As Unca Stan might say, "Make Mine MoCCA!" Thanks, gang! It's been one wacky whirlwind of a week around here, what with my day at MoCCA, followed by Julie's extended High School Graduation shenanigans--with temperature's nearing the century mark all the while, no less--and hopefully, by the weekend, I'll have cobbled together a short summary of said events (photos included), but for today, I wanted to share with you an email that arrived only minutes ago. My publishers at Image Comics sent off a comp copy fresh from the presses directly to one of the noted contributors to my recent book, and today, unsolicited, I received the following note. Just received a copy of "The Nearly Complete Essential Hembeck Archives Omnibus." After typing that lengthy title I'm too exhausted to write what I intended to say. So goodbye. Now that I've gotten my second wind I just wanna tell you that it far exceeded even my wildest expectations. I knew it would be good, I knew it would be entertaining, I knew it would be brilliantly done, but honestly-- my Introduction was even better than I could ever have imagined! Oh, the book itself? Lemme tell ya-- I had to do 100 push-ups daily for two weeks before I could lift it. All those heavily-laden pages, each one a veritable book in itself! It sure gives the reader his money's worth. So far I'm up to page 2,567, and that's only the first chapter. Seriously (a word I hate) (and a mood I hate even more) the book is terrific, a great homage to you and your really brilliant work. I tossed away three copies of The Harvard Classics in order to give it an honored spot on my bookshelf. Loved the cover, even though I looked and looked but none of those faces seemed to be mine. I'd like to keep typing this meritorious missive to you but have to stop now because of the horrible case of eyestrain I got by refusing to skip over even one precious word of the twelve-zillion you managed to crowd onto each page. But I want to leave you with this comforting thought-- When I receive my well-deserved royalty for the book, I promise to try to convince Image to give you a portion of it, no matter how small, for the well-intentioned contribution your pages have made to my Intro. Now I can't wait till the unabridged version comes out! 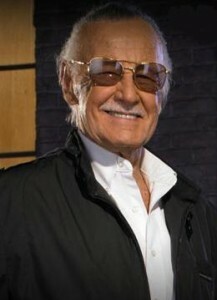 Excelsior, ol' friend. May it keep selling and selling and selling! Thank you Mr. Lee! I'm happy to report that readers are responding ever so favorably to your imperishable words of introduction--and many are even sticking around to scan a few of my verbiage laden pictorials!! Mucho gracias, Senor Hang Loose!! 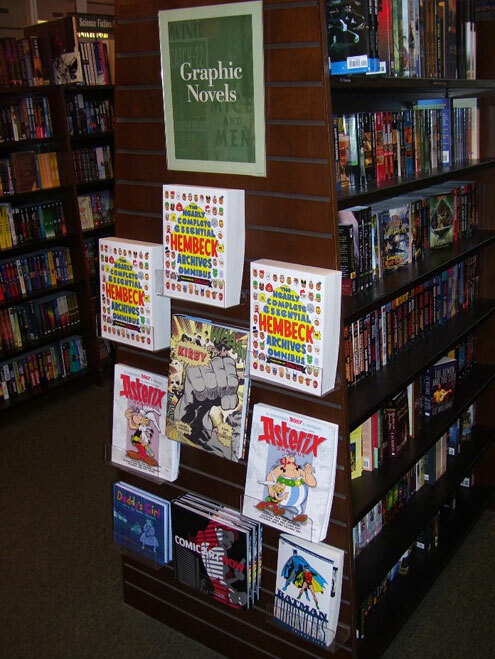 Oh, and for yet another installment of the newest web-wide obsession, "Stuff Fred Left Out of His Omnibus", you may want to take a peek at the latest bunch of missing Hembeck pieces unearthed by good ol' BookSteve! Gee, I sure don't know how I coulda missed any of THOSE! Julie's been looking around for a summer job. After submitting several applications at various places, yesterday she was called back to interview for a position at our local "Just A Buck" outlet. Now, there are plenty of reasons why she's hoping to get that particular job, but you know what the biggest benefit of all would be? Just a quick note as the temperatures near the three digit mark and we prepare for this evening's pre-Graduation dinner: the missing Dateline:@#$! I mentioned in my last blog entry has been found!! Thanks to Jeff Kapalka, BookSteve, and Bob H of Four Realities for tracking it down. Turns out there must've been some sort of typo in Sean Howe''s EW review, since it was indicated to be from 1981. Turns out it was actually a late nineties strip, one that featured (and this would've been the immediate tip-off for me had her name been mentioned) Oona Goosepimple! Yes, Oona Goosepimple--a name like that is hard to forget!! And speaking of Bob H., he's posted another two of my full-color COMIC READER covers (both inked by the perpetually young Bill Anderson) that somehow slipped through the cracks, not making it into the recent OMNIBUS. So, if you're curious, go take a gander. And thanks guys--now that you've found that strip for me, I can sleep at night. Trust me--several years back, when Al Gordon first suggested I put a compilation of my old strips together, I was more than a little dubious. And one thing I NEVER would've believed at the time was that a review for the thing--a pretty darn positive review at that--would turn up on the Entertainment Weekly website! 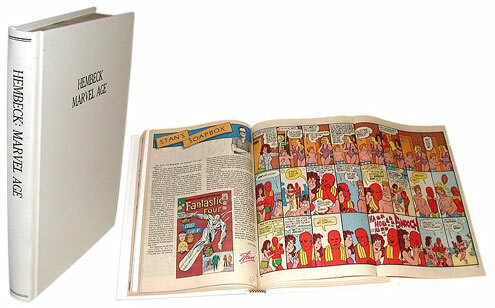 But here it is in all it's glory--EW's Sean Howe's review of THE NEARLY COMPLETE ESSENTIAL HEMBECK ARCHIVES OMNIBUS! This just in: pigs have just commenced flying, film at eleven. But here's a curious thing--I can't seem to find number 9 in my book! It sorta SOUNDS like something i may've done, true, but I honestly can't seem to locate it!! And yeah, I know--the lack of page numbers doesn't help any. But if one of you out there CAN find it--and describe, more or less, where exactly it is, PLEASE let me know. Sounds like a fairly interesting strip!! Entertainment Weekly--who'da thot? Not me, that's for sure! Today, my daughter is finishing up a nearly month-long internship at the Hudson River Museum. At Julie's school, they have this interesting program where high school seniors devote most of their final month in 12th grade interning somewhere that's of specific interest to them (the teachers naturally help them secure their desired venues). And since Julie is big on science, her physics professor recommended her for a job helping out in the museum's planetarium. Now, it certainly woulda been nice if said museum were right down the road or something, but it isn't--it's in Yonkers, and to get there, Julie had to drive about 12 minutes to the nearest train station each morning before 8 and then hop a locomotive for about ninety minutes to arrive at her destination (which was , as it turned out, both cheaper and faster than driving down each day in a car--but still a lot closer than the three girls who chose to go to India for their internship!! THAT musta been one heckuva a commute!!). Julie really enjoyed her time working at the museum (and learned stuff, too--all of a sudden she's dragging me outside at night to look up at the Big Dipper! I counter by pointing out Rann and the remains of Krypton, but she ain't buying into it--my little girl, all grown up and way less gullible. Sigh...). Lynn and I drove down to the museum the Friday before last to check things out, as well as bring her home personally, since this was the one evening she was scheduled to stay late and help out with the 7 o'clock show (usually she left around 5). It's a very interesting museum because they seem to have a little bit of everything--we were there for the last day of an exhibit devoted to a fascinating (and undeniably cartoony) artist named Red Grooms. Aside from that, they have a permanent exhibit devoted to (what else?) the Hudson River, and there's even a corridor built from the modern structure that takes you over to a nineteenth century mansion right behind the main building that reminded me of nothing short of a less macabre Haunted Mansion! All that plus a planetarium! If you're anywhere nearby, well, there are worse ways to spend your time--go!! I think it's a well-conceived program, giving the kids a nice taste of real-world responsibilities while still being on a bit more appealing level than simply flipping burgers or bagging groceries. And for us parents, it gave us a glimpse of the all-too soon approaching days when our college-bound offspring finally fly the coop. 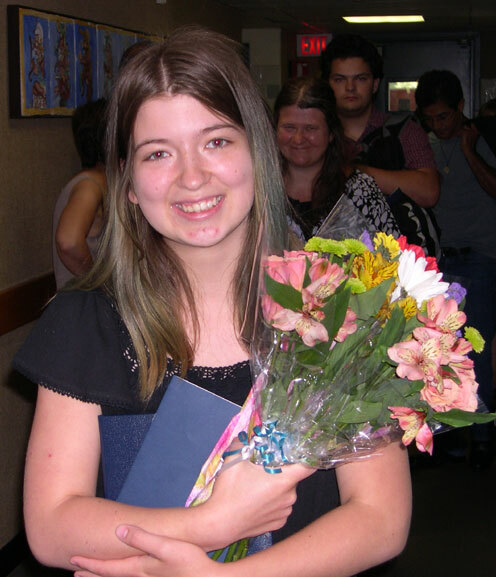 Tomorrow, Julie goes back to Poughkeepsie Day School, presumably to check in with her fellow classmates and teachers (all final testing was wrapped up before this current endeavor). Saturday, as I mentioned yesterday, we're all going down to MoCCA. Sunday, there's a dinner for the class (which numbers only a few more than thirty) at one of the professor's homes. Julie goes to school Monday, and in the evening, there's a dinner for both parents and graduating seniors over at local Vassar College. Tuesday, the kids each tell a little something about their internship to the younger students during a school assembly, then do it all over again for the parents in the evening (that COULD turn out to be quite a long night, I'm guessing...). Wednesday morning is Graduation in front of parents, relatives, friends,and the rest of the school--and yes, each senior gets to give a little speech of their own! (ANOTHER long day, no doubt--one that'll be captured on DVD, available to all us proud moms and dads for a (coff coff) modest fee). Followed by a party Wednesday evening, and another Thursday afternoon (the latter of which includes parents, meaning us). I put this all on the record just to indicate the level of busyosity that will be swirling inexorably around my usually calm little life over the next week, and to beg the indulgence of those of you out there still waiting on commissions (you know who you are)--I'll keep at 'em, but there WILL be a bit of a slowdown in the next few days. Cuz, y'know, yer only kid doesn't graduate high school every day, dig?? And to echo just about every other parent out there with a 12th grader in their family, how'd it ever come to THIS? I can still remember walking Julie home from the bus after her first day of first grade a few weeks after we moved to this house! Man, time flies when you're raising a dual physics/fine arts major, don't it? More about all this--and MoCCA, too--in the days to come (if I can find a few minutes at the keyboard to spare, that is...)! On Saturday, June 7th, between the hours of 1 and 3 PM, yours truly will be one of the volunteers doing sketches for MoCCA at this year's annual Art Fest, so if you're so inclined, stop by and say "howdy"--and maybe even buy one of my quirky li'l scribbles--it's for a good cause! The rest of the day, I'll be walking the floor, checking out all the graphic goodness on hand, mingling with some of the most talented cartoonists working today, so no, I WON'T be sitting behind a table promoing my new book. BUT I do now in fact have some copies of my own on hand to offer any of you folks out there who might be inclined to desire a signed copy (with or without a custom drawing of your choice included on page one--click the book's icon above to read further details). Just today I shipped off the first pair of personally illoed editions, and do you know who the very first two characters chosen to greet their respective owners on the opening page were? Oh, and you know the title of my book? The part about "Nearly Complete"? All too true. I was checking out Daniel Best's 20th Century Danny blog earlier today, and noticed that he included scans of three pieces of work I did for The Comic Reader roundabouts 1980, all of which were printed in color, a rarity for me back then (and even now). Two of those drawings are included (sans hues, sadly) in the new book (since they were both part of THE HEMBECK FILES contents), but the third--featuring Black Lightning--is a drawing I have almost no memory of--and apparently, no original for, since it didn't turn up anywhere when I was rummaging through my files to put this compendium together! Too bad--though the gag would make absolutely NO sense in black and white, so maybe it's all for the best. And speaking of which, thanks Danny for digging it out and posting it! I'm feeling just a shade more complete because of it--and maybe now some of my interested readers (both of you) do as well!! 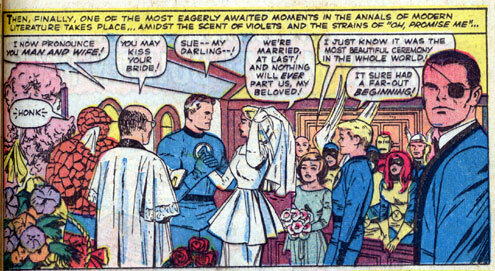 Most tried and true comics' readers recognize the above as the (you should pardon the expression) climactic scene of "Bedlam At The Baxter Building" (aka "The Wedding of Reed and Sue") from 1965's FANTASTIC FOUR ANNUAL #3. Just the other day, for the first time in several decades, I sat down and reread this pivotal piece of funnybook history in the pages of the second spiffy volume of the FANTASTIC FOUR OMNIBUS (though the above scan is taken from the original comic), and I noticed a very blatant boo-boo that I had never, ever seen before! Have you taken a look? A good look? Then maybe you see what I see. Over Sue's shoulder. To the right of her veil.